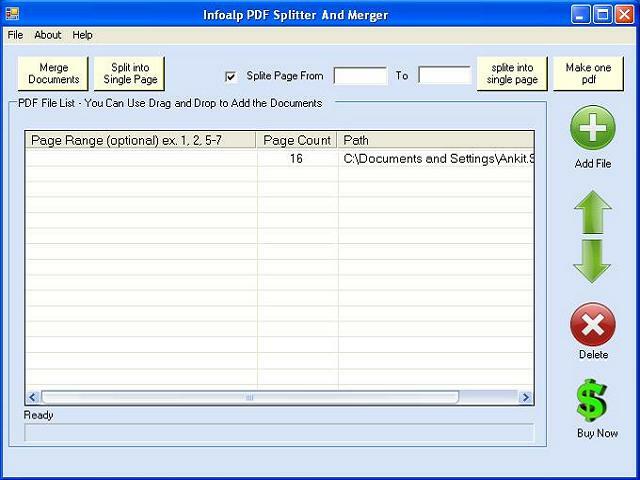 PDF Splitter & Merger is a PDF tool developed for quicker and more efficient access to information needed from your PDF files, reorganizing them in a way that makes them easier to manage and handle. With the ability to split PDF files into separate documents, either by page range or page numbers randomely, and merge an unlimited number of PDF documents into a single PDF file, our solution helps you gain control of all your PDF files. * Offers several methods to split PDF files . Qweas is providing links to free pdf merger 4.0.1.5 as a courtesy, and makes no representations regarding free pdf merger or any other applications or any information related thereto. Any questions, complaints or claims regarding this application free pdf merger 4.0.1.5 must be directed to the appropriate software vendor. You may click the publisher link of free pdf merger on the top of this page to get more details about the vendor.